When you think of speed and stability when it comes to boats, you wouldn’t be the first to think: catamaran. with a ‘cat’, you’ve got the reliability of less hull movement. The geometrically-stabilised craft have a wealth of essential elements that these boats manifest. Mid-way through last year, French-based superyacht designers and manufacturers, Sunreef, released its latest concept design and it really accentuates the luxury of sailing in one of these sea dwellers. 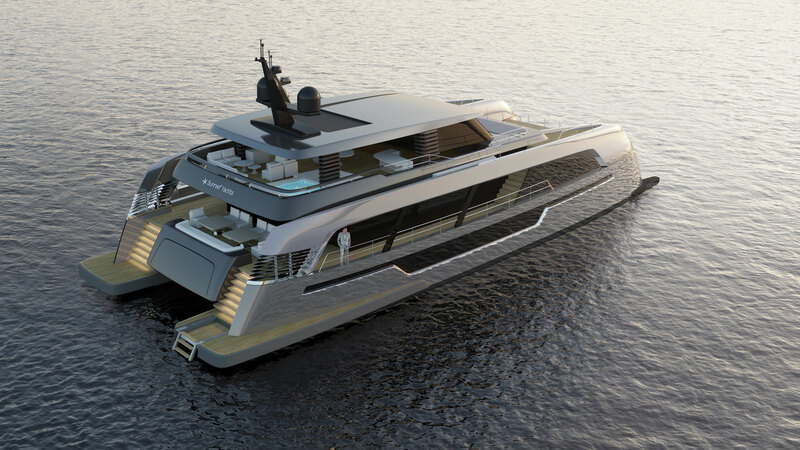 Named the 120 Sunreef Power, this catamaran is 40 metres long and features an aerodynamic design that makes the catamaran look modern with a wide hull and generous chrome glazing. The coolest things are definitely the LED lights on the bottom of the boat that gives the catamaran quite an exotic look. On the inside, the decor is designed to really compliment the exterior. The boat can accommodate up to eight guests and eight staff members. On the main deck, grand glass doors open into a saloon of a dining room and open-plan area to entertain guests. Other little trendy additions to the 120 Sunreef is multiple spa pools and a docking bay that holds the jet ski. Details and information will be released later this year at boat shows around the world.